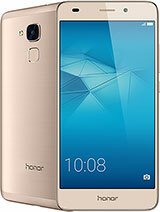 Huawei’s Honor 5C is a mid-range phone that comes with a Full HD display, and the company’s own chipset, the HiSilicon Kirin 650 that is said to be good on performance. Along with that is a good 2GB of RAM and 16GB internal storage. The camera combination given on the Honor 5C is something you would like because of the aperture, with the device having a 13-megapixel rear camera with F/2.0 aperture, and an 8-megapixel camera with F/2.0 aperture on the front for selfies and video chats. It is a Dual SIM phone with both the slots supporting Nano SIM cards, but the second slot is a hybrid one and it either can have a MicroSD card or the secondary SIM. There is Android Marshmallow OS with Huawei’s Emotion UI in place for the users. The phone has FM Radio support and there is a fingerprint sensor on the back of the device as well. Check below for the full list of specifications of the Honor 5C. Huawei Honor 5C has a metal body, a HiSilicon Kirin 650 chipset and that is said to offer a good performance. But will the 2GB suffice for the multitasking?